Fax machines are made with metals that are toxic to the environment when not properly processed, so don’t throw them in the trash. Staples offers free, in-store recycling for unwanted electronics, including fax machines, desktop computers, tablets, printers and other electronics. Locate your nearest Staples. Canon offers a recycling program for certain consumer products like fax machines; check if they accept your product by typing its name in the finder. Instead of buying a fax machine, send and receive your faxes online with a service like MyFax or eFax for a monthly fee. If you receive junk faxes from solicitors, opt out of receiving them. By law, companies that send junk faxes must include contact information so the recipient can opt out. To learn more, check out this FCC guide. 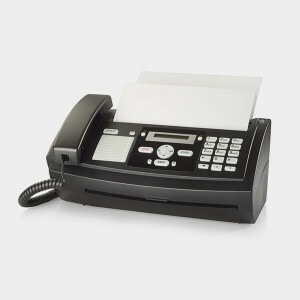 Create a pile of paper that’s been used on one side next to your fax machine and use it to send faxes. Look into purchasing a used fax machine that’s in good condition, or buy a fax machine that’s high quality and will last. Both of these options are better for the environment than buying a new piece of equipment that will soon have to be replaced.